American Indian Bracelets and American Indian Jewelry are an American heritage that have been handed down to Americans from the American Indians of Southwest regions of the United States since about 1870. The American Indians as well as many other individuals in the Southwest have made an industry out of American Indian Turquoise Jewelry and it is respected throughout the world for its unique qualities. 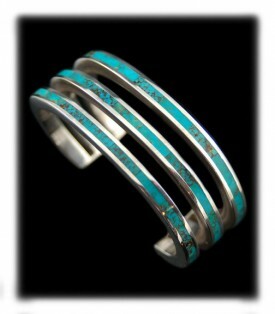 American Indian Jewelry is generally made with American Turquoise from Arizona and Nevada and is set in Sterling Silver. There are many types of American Indian Silver Jewelry which is made, in general, by Native Navajo Indians, Zuni Indians and the Hopi Indians of the American Southwest. 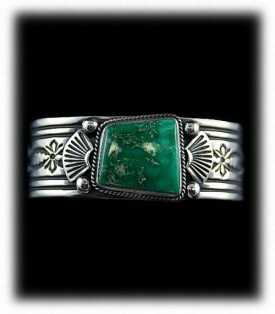 The Native American Indians discovered Turquoise in Arizona and New Mexico as early as 300 B.C. They worshipped the gemstone and believed is was put on earth from the great ones above. 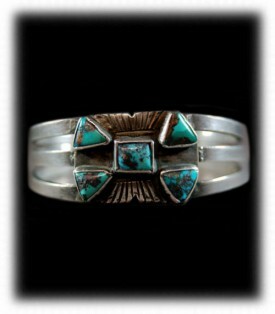 Turquoise was used early on in ceremonies and by medicine men for healing. As Turquoise became more plentiful Native American Indians began working the Turquoise into Turquoise Beads and ornamental items that they could wear. Turquoise has played a very important roll in the Southwestern regions of America for over 2000 years! American Indian Bracelets are one of our specialties here at Durango Silver Company, this informational page is meant to help you gain some important information directly related to American Indian Bracelets. We invite you to check out the American Indian Bracelets we have on hand now! you some great information on each particular piece of American Indian Jewelry. Above and to the left is an American Indian Bracelet handmade by Edison Yazzi, Navajo. This Sterling Silver Bracelet was made by handcrafting a Silver Bracelet Shank out of sheet silver overlaid on each side with another piece of sheet Silver to make a channel or recessed area on the Bracelet to be inlaid with the gemstones to be used. Next, Edison took individual gemstones and ground them on a lapidary grinding wheel into the shapes he desired to complete his design. 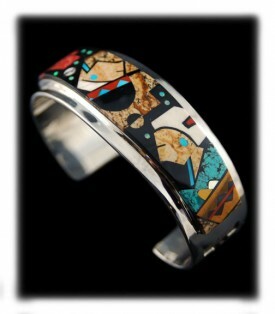 This is called a pictorial Inlaid Bracelet as Edison has created this wonderful one of a kind unique design of a native man in Canyonlands on one side of the Bracelet and a Indian Maiden by a river with a bowl of corn. Needless to say this is a wonderful work of art because each and every gemstone is hand cut and an individual piece. These gemstones are hard and not easy to cut, so this is truly and valuable American Indian Bracelet made by a very talented American Indian Artist, Edison Yazzie. It features Sleeping Beauty Turquoise, Spiny Oyster Shell, Black Jade, Picture Jasper, Tiger's Eye, Ivory, Wild Horse, Opal and Spider Web Tibetan Turquoise all hand cut into different shapes to make this wonderful design. We highly recommend Edison's work and have as many pieces on hand as possible, his work is a tremendous investment in an American heritage for you! Above and to the right is and older Navajo American Indian Bracelet that is inlaid with Turquoise, Lapis and Spiny Oyster Shell. This unique Indian Bracelet was made by hand sawing out a cutaway in sheet Silver and then over laying it onto a piece of triangular Silver wire, next the Navajo Artisan hand stamped the balance of the Silver Bracelet to complete the design. Next, the Artisan hand cut individual pieces of Turquoise , Lapis and Spiny and proceeded to fit them into the recessed channels of the Bracelet. He then sanded and polished the gemstones to complete this one of a kind piece of Native American Indian Jewelry, a marvelous American Indian Bracelet. You can see more angles and info of this Navajo Indian Bracelet on its presentation page. This is not and easy task and there are very few Jewelers that would take the time to do this type of work. This is another example of why American Indian Jewelry is not only a great American heritage, it is a fantastic investment in a true art that is Native American handmade in the USA! 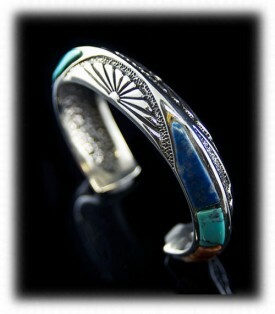 Above and to the left is a Inlaid Turquoise Bracelet made by Zuni Native American Artist, Larry Loretto. 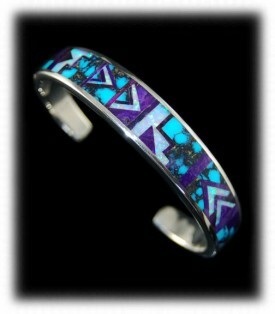 This is a very unique Native American Indian Bracelet as its design is highly unusual. 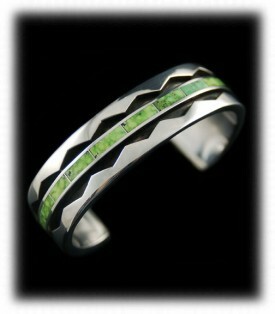 Notice the three individual inlaid Silver channels that are separated at the bottom of the Bracelet? This is a classy and certainly one of a kind piece of American Indian Jewelry. This Inlaid Turquoise Bracelet was made similar to the channel Bracelet above - the three channels were fabricated to inlay the gemstones into voids. The Turquoise in this bracelet was precession cut to fit the channels as will as precisely cut so you cannot see where the stones come together. Larry did a great job on this beautiful inlaid Bracelet, all of Larry's American Indian Bracelets are unique and excitingly unusual. To the right is a Sterling Silver Inlaid Cuff Bracelet created by Native American Indian Artist Glendora Booqua. 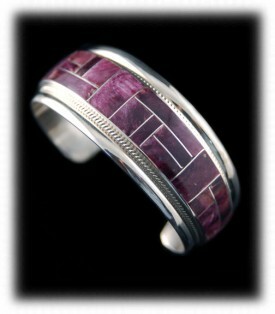 This contemporary Zuni inlaid Silver cuff Bracelet features mosaic inlay of purple Spiny Oyster shell all around the cuff. To each side of the gemstone inlay runs a rope or cable design incased in half round wire. American Indian Bracelets such as this one are a pleasure to wear as they have an ethnic appearance and look natural when worn. To the left is a Navajo American Indian Bracelet in Sterling Silver with 60 Sleeping Beauty Turquoise Gemstones, by Navajo artist Patrick Yazzie. This American Indian Bracelet was made much different than the Inlaid Bracelets above, this is a classic Navajo style of Indian Jewelry. Turquoise Cabochons are cut and then Silver bezels are carefully wrapped around each stone, they are then Silver soldered together to make a housing for each stone. Next, the Silversmith creates a Bracelet frame out of Sterling Silver sheet - he places the Turquoise gemstones with their bezels on top of the sheet and creates the layout of the design and traces the design on the Silver Bracelet frame, removes the stones and cuts out the Silver sheet to the shape he wants to complete the Bracelet. The Silversmith now bends the Bracelet frame into it cuff shape. The stone bezels are attached onto the Silver sheet with steel wire holding them in place and then he Silver solders them to the Bracelet frame, he then finishes the design soldering Silver raindrops between the stones. The Bracelet then goes through many steps to finish it up. American Indian Bracelets such as this have been very popular in the Southwest and beyond for over one hundred years and still are today. To the right is a Navajo Silver Overlay Bracelet. This Silver Cuff Bracelet was made by Native American Indian artist Tommy Jackson, it features a rare and beautiful rectangular Mawsitsit Jade gemstone from Burma or Myanmar - Mawsitsit is the rarest form of Jade. The Bracelet frame is an overlay where the top Silver sheet has a design hand sawed and then it is sweat Silver soldered onto a backing plate, also made of Sterling Silver. The Bracelet frame is shaped into a cuff and then the bezel to hold the Mawsitsit gemstone is Silver soldered onto the Bracelet frame. American Indian Bracelets by Tommy Jackson are beautiful and in high demand, Tommy makes a great variety of Native American Indian Jewelry, his work can be seen throughout the Southwest as well as the Internet. To the left is a classic American Indian Bracelet made with heavy stamp work and a Turquoise gemstone set atop and entered on the Bracelet. Native American Indian Bracelets such as this one are typical of Navajo Indian Jewelry and have been made for well over a hundred years. 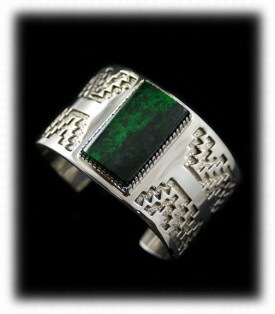 This Broken Arrow Turquoise and Silver Cuff Bracelet was made by Navajo Artisan, Aaron Cadman. The hand stamping is done by laying out the pattern with scribing tools and then design stamps are carefully lined up in place and then hit with a heavy hammer. There are differently Navajos that specialize in stamp work and it really shows when a talented craftsman does the stamp work. 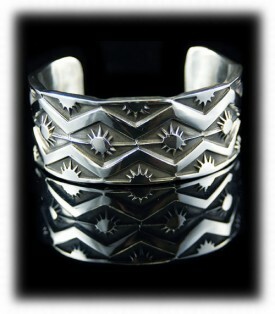 To the right is an example of a heavily stamped Navajo Silver Bracelet that is bold due to its deep stamp work. 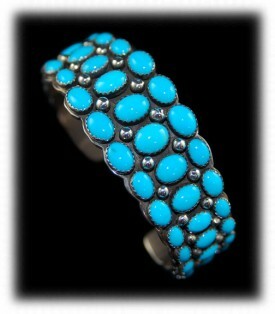 American Indian Bracelets such as this have been made for over 150 years by Navajo Silversmiths. Many Navajo men wear stamped Silver Bracelets with no stones, they are very masculine and easy to wear on an every day basis. There is a great variation in the style and stamp designs of this type of Navajo Silver Stamped Bracelets through different time periods. There are many classic periods for this type of American Indian Jewelry. Above and to the left is one of our best selling inlaid gemstone American Indian Bracelets. This American Indian Bracelet was Native American Indian handmade in Sterling Silver and features a beautiful Southwestern geometric pattern made of natural Tibetan Turquoise, Gilson Opal and Sugilite. The inlaid gemstone pattern covers three quarters of the Silver Cuff Bracelet and is accented on each side with stamp work designs in the Sterling Silver framework. The inlay work on this bracelet is remarkable! Durango Silver Company is well known for having the finest quality Native American Indian Bracelets and we are constantly on the hunt for fabulous master pieces of gemstone inlaid Native American made Bracelets. If you do not find something special on our site today, come back often as we add new pieces to our collection daily. To the right is a Native American Indian Bracelet handcrafted by Phil Loretto, (Zuni). This is a fabulous heavy weight Mens Turquoise Bracelet that features some of the most sought after Turquoise in the world today, lime green Carico Lake Turquoise from Nevada USA. Phil is a master Silversmith and Stone Cutter, his creations are outstanding and stand out from most other Native American Artisans. This quality of work will, no doubt, become very valuable in the future as they are already museum quality today. We highly recommend the works of Phil Loretto as he is one of our favourite Native American Jewelers, we try to have as much of his work on hand at all times so check out what we have today and come back often as we do get Phil's American Indian Jewelry. To the left is a three stone Fred Harvey Turquoise Bracelet, Circa 1950's. This is a really neat old bracelet with some pretty old Turquoise, appears like it is from the Cerrillos Turquoise Mine of New Mexico, USA. 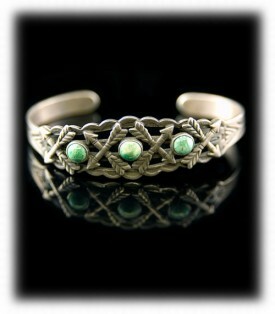 This Bracelet has intricate stamp work with a crossed arrow design which is in excellent condition. The shank or frame is stamped all the way around. The Turquoise stones are still shiny which tells us this bracelet really wasn't worn much and was taken care of. We purchased this Silver Bracelet from the Fort Defiance/Francis Griswold collection and it probably sat in his vault until it was sold to us in the 1980s, at which time it sat in our vault until now. Check out the Fort Defiance story, you will enjoy it! Vintage American Indian Jewelry pieces are getting hard to come by as many people search of old American Frontier Antiques and old Indian Jewelry is very colorful and has a historic past in American history. To the right is a great Antique Navajo Silver Bracelet that was also purchased in 1982 from the Fort Defiance Trading Post collection. This is an old Navajo Turquoise Bracelet from the 1930 period that has a classic old desirable style to American Indian Jewelry collectors. The hand forged split shank Bracelet from was made from coin Silver that the Silversmith got from the Indian Trader. The design shows us its age as you can see it is somewhat archaic on today's standards, however, this is what antique Jewelry collectors look for. John Hartman has been collecting antique American Indian Jewelry most of his life, we try to always have some good examples available in our Silver Gallery, check back often. We hope you have enjoyed our presentation on American Indian Bracelets and have gained some useful knowledge from it. We invite you to learn more about Turquoise and Turquoise Jewelry by following the links in our Learning Center to other informational pages that we have written on different topics related to American Indian Bracelets. In addition, we would like to invite you to join our E-Mail Newsletter - about once every other month we send out a Newsletter to inform our members of what's happening with Durango Silver Company, new products, specials for our members and more. We also have a monthly drawing from our member base to give away free Turquoise Jewelry from our company. Please take a moment to become one of our friends by signing in below. We have the largest Trader Direct information resource for American Indian Jewelry, Turquoise Jewelry and American Indian Bracelets, we hope you will think of Durango Silver Company the next time you are considering American Indian Bracelets for all of your needs.